It’s New Mexico in 1922. When a movie company arrives in Santa Fe to film a Western, The Far Sunset, everyone is excited. The lure and glamour of the movies soon becomes definitely unattractive as the director of the picture as well as a few of the stars prove themselves as unlike their onscreen personas as possible. Maddie Vaughn-Alwin, widowed socialite turned artist, who fled to the southwestern town after her husband’s death is a little more interested than most because her cousin Gwen Astor has a bit part in the movie. Gwen was Maddie’s best friend as well as closest relative until the two drifted apart, Maddie to marry and Gwen going to California, seeking her fortune as a movie star. Things have happened differently than either expected, though Maddie had the better fortune of the two since she married her childhood sweetheart and they had a few happy years together before his death in the War. She now has a new love interest in Dr. David Cole, a British physician living in Santa Fe, and is surprised to discover childhood friend, Will Royle, is now the screenwriter on the movie. Gwen, on the other hand, is now suffering the scorn of director Luther Bishop with whom she had an affair and quickly became disenchanted with him, though not with movie making as a whole. Luther definitely is not a person whom one likes for very long, and when he turns up very dead, no one is surprised, not even Maddie, who finds the body. “Is anyone there?” she asked and heard a strange creaking noise. She pushed the door open. “Oh, no. No, no,” she gasped but feared this was not a sight she was likely to forget any time soon. Mosy of the movie company, even his wife, will worry more about how his death affects their movie than whodunnit. Soon, however, some of the cast will be distracted by other things as their fictitious lives clash with the actual, hidden ones, and nearly everyone is discovered to have a reason to want Luther dead. Those stories going behind the scenes are fascinating—whether it’s making a movie, performing a stage play, or promoting a novel—and contrast real events with the fictional ones. A Moment in Crime gives some good background information on how movies, and silent movies in particular, are created, and the hectic chaos of those earlier filmings. Though this is the second novel in a series, enough background information is given about Maddie, Gwen, and their families that the reader won’t be confused by the cast of characters, and an entertaining cast it is. There’s not much overt action or violence, but the characterizations and narrative make up for that. In fact, the entire story could be the plot of a film contemporary for the situation. Throw in some slang from the era and references to actors and actresses of the time, as well as descriptions of the beauty of the southwest, and you have an enjoyable cozy of a mystery novel. There’s even a bit of romance for Juanita, Maddie’s housekeeper when one of the players turns out to be a local Native American turned actor. This one is for those who like a cozy mystery with some intriguing characters and a plot straight from a silent movie. 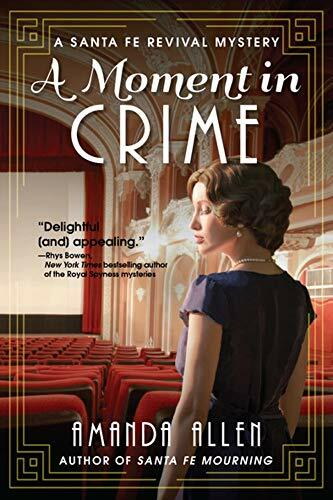 The praise for A Moment in Crime is well deserved.